AORD - What is it and what does it mean? 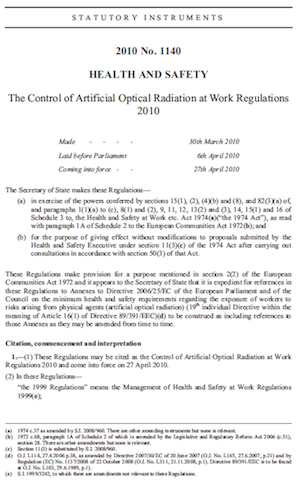 The Artificial Optical Radiation Directive or AORD as it has become known is a piece of legislation that was approved by the European Parliament during April 2006, under the reference of Directive 2006/25/EC . It was designed to protect workers from harmful levels of exposure arising from Artificial Optical Radiation in the workplace. In the UK, the Health and Safety Executive (HSE) published a set of specific legislation to implement the directive. The regulations are known as the Control of Artificial Optical Radiation at Work Regulations 2010. What is Artificial Optical Radiation? Any manmade source of light, whether it is visible or invisible is considered to be Artificial Optical Radiation. Office lighting, computer displays, blowtorches, welding arcs and stage lighting are all examples of typical light sources. The majority of light sources in most workplaces are considered as ‘trivial' and do not present any significant optical risk to workers. Does this mean I need to check every light source in my workplace? It is unlikely that you will need to go around checking every single source of light in your workplace. This is not the intention of the regulations. Only light sources that emit large amounts of light, or special types of light such as UV, Infrared, or laser light are likely to be the sources of particular concern. HSE are keen not to burden business with checking light sources that pose no harm to workers. How do I know if a particular light source is harmful? The legislation refers to what are known as Exposure Limit Values ( ELV's). These values are based on scientific research and describe the levels that must not be exceeded. It is not always a straightforward process to interpret the limit data provided in the Exposure Limit tables, therefore in the first instance, advice should be sought from the manufacturer or supplier as to how much and what types of light their devices emit. In time, manufacturers should be providing this information as standard. LVR are able to undertake AORD workplace assessments and assist you with the risk assessment process if required. What do I need to do for the regulations? You need to have think about the types of light sources that are used in your workplace, and if there are any sources of bright light, or special types of light such as Ultra Violet or UV Light, Infrared or Lasers being used. If there are any sources that you are concerned about, in the first instance, contact the manufacture and ask what Risk Group (for lamps) or Class (lasers) the product is. Think about how it is used, and what training and instruction staff are given, and how they may be exposed to the light. Manufacturers of light sources have a legal duty to pass the necessary safety information about their products on to people that they supply to. However getting the correct information from manufacturers in order that you can assess the risk is not always straightforward. The interest in light source hazard potential is relatively recent, particularly as some hazards are only emerging with the advances technology as new light sources are introduced. Therefore not all manufacturers may have the information to hand, whilst others appear less keen to discuss the potential harm that their products may cause. It is hoped that this situation will improve as the legislation beds in. LVR are able to assist originations assess occupational exposure to their employees, to help protect workers, and ensure regulatory compliance. Following assessment, appropriate control measures can be devised and action plans put into place. For manufacturers of light sources, LVR are able to assist in product testing to either the lamp EN 62471 or laser EN 60825 safety standards so that the suitable safety and any warning information can be provided to users of the products. Are there any industries that use lots of harmful light sources? Why do we have these regulations? The EU has already produced two previous Physical Agents Directives, for Vibration and Noise. These have already been implemented as UK law through the Control of Vibration at Work Regulations 2005, and the Control of Noise at Work Regulations 2005. In order to create a level playing field across Europe, these directives are intended to provide a minimum level of protection for all workers across the European Community. The measures are designed to prevent harm to workers, due to exposure of the skin and eyes to coherent and non-coherent artificial light sources in the work place. The regulations provide explicit clarification of what is required, and make a specific request for risk assessment of optical exposure to be considered. Depending on the outcome of the risk assessment, appropriate action plans and control measures need to be developed. The legislation sets legally binding limits for maximum exposure. LVR has a good scientific and practical understanding of the assessment techniques required by manufacturers, and users of high intensity light sources. Contact us to see how we can help you prepare your products or your workplace to comply with the regulations.